Many team captains hold unseen value as leaders off the ice, but on Saturday it was on the ice that Minnesota State captain Marc Michaelis stepped up and extended the Mavericks’ unbeaten streak to six games. The Mavericks were down 2-0 to the Michigan Tech Huskies when Michaelis cut the lead in half with just 52 seconds remaining in the second period. Then, 5:35 of game time later, Michaelis scored his second of the game to even the score at 2-2. The junior’s night wasn’t done there, as he led the Mavericks to three unanswered goals, capping a three-point night with an assist on Connor Mackey’s game-winning goal less than two minutes into overtime. “Marc Michaelis really stepped up in the third period,” head coach Mike Hastings said following the comeback victory. It was a demoralizing end to Michigan Tech’s annual Winter Carnival in Houghton, as Michaelis’ effort earned him the Winter Carnival MVP. The captain’s charge came after a rare two-game point drought, but his will to win carried the Mavericks to a 5-0-1 record through their last six contests and a 24-6-1 overall record. The streak hasn’t gone unnoticed, as the Mavericks were bumped up to No. 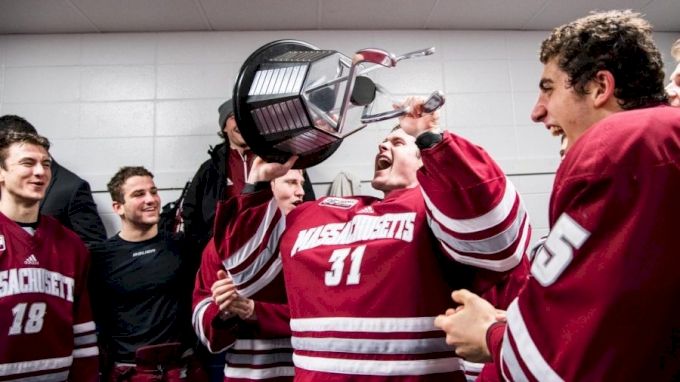 5 in Monday’s USCHO Poll following five weeks stuck between No. 6 and No. 8 after an eight-week mainstay in the top five. Michaelis now leads the Mavericks with 15 goals and 33 points through 32 games. The Germany native is just three goals and four assists shy from matching his career numbers established last season. With a bye week on the schedule, a few players will get the chance to rest up, including forward Jared Spooner, who was injured in Friday’s game. The sophomore sits third on the team with 24 points (6 G, 18 A) in 31 games. Michaelis and the Mavericks have four games remaining to further pad their 16-point lead in the WCHA and work out any kinks ahead of their NCAA Tournament aspirations. Tune in live, right here on FloHockey to watch Michaelis and the Mavericks’ last four regular season games ahead of the WCHA Tournament.